U.S. Bank Stadium is a fixed-roof stadium being constructed in downtown Minneapolis, Minnesota. The project is the new home of the Minnesota Vikings football team. The stadium is the anchor of substantial redevelopment in the City of Minneapolis. Architect HKS and the Minnesota Sports Facilities Authority are targeting LEED certification for the stadium. Contributing to LEED certification are an innovative roof system that will help with both heat prevention and heat retention, energy efficiency, public transportation, and stormwater management. Since the stadium is being built downtown, there is limited footprint for a stormwater storage system. Engineers chose to store the stormwater in an underground retention system that would provide the required storage in a limited and constrained footprint. The retention system is made from 1,000’ of 144” diameter perforated Aluminized Type 2 corrugated metal pipe. The system not only stores the water, it releases it slowly over time into the surrounding soil via the perforations in the pipe. This reduces the amount of runoff leaving the site, recharges the ground water supply, and eliminates the need to pipe the water into the city’s sewer system. 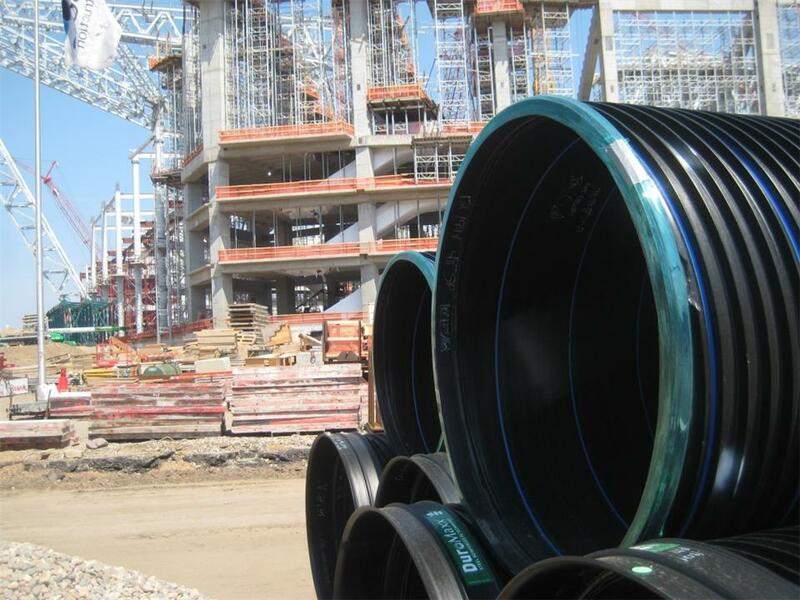 Also used was 400’ of 48” diameter DuroMaxx steel reinforced polyethylene. DuroMaxx was used as it can be made watertight, which was needed since the pipe was located behind a retaining wall.